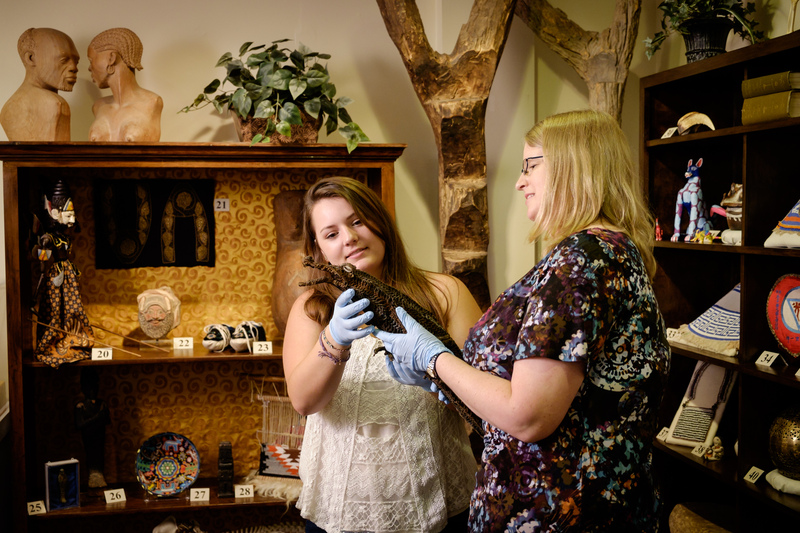 Lindsay Gilliland (’18), along with three other student employees, had an eye-opening experience taking control of the Museum of Anthropology’s (MOA) summer exhibit, MOA’s Cabinet of Curiosities. According to rising junior Gilliland, it was “by far one of the most interesting things I’ve done at Wake Forest.” Never before has the Museum featured a completely student-run exhibit. 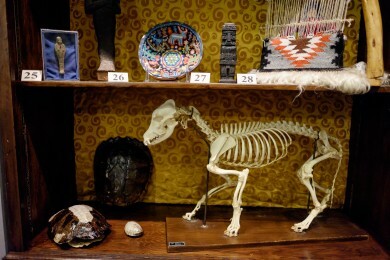 “We looked at Cabinet of Curiosities as a way to reward the invaluable work of our student employees while simultaneously allowing them to improve upon their curatorial skills,” explained Sara Cromwell, interim assistant director of MOA. Each student hand-picked 10 items from the Museum’s vast collection, conducted research on the items that they selected, created a brochure of the information they found, and installed the pieces for display. The exhibit also included help from a Salem College student, whom museum educator Tina Smith worked closely with. While the student work on the exhibit is a first for the Museum, so is the theme of a cabinet of curiosities. “We wanted to create a space for objects from our collection that haven’t been exhibited recently, or in some cases, ever,” said Cromwell, about the origins for the project. These objects haven’t fit the themes of previous exhibits, and therefore haven’t found a place to be displayed, until now. A cabinet of curiosities allows for all of these items to fit in well. Cabinets of curiosities, or wunderkammem (wonder rooms), originated as private collections of exotic and extraordinary objects in mid-sixteenth century Europe. Looking for a way to verify their wealth, individuals displayed as many foreign objects as they could in a jam-packed room of their home. The items represented a diverse group of disciplines such as fine art, natural history and anthropology. These displays served as precursors to modern museums. Items in the exhibit Cabinet of Curiosities at the MOA. “Channeling the aesthetic of a cabinet of curiosities gave us a completely new means to showcase many new items,” Cromwell said. Instead of using the usual glass-cases, the exhibit places the objects all over a Victorian-era room to make visitors feel like they just walked into a home of the sixteenth-century European elite. The collection includes pieces ranging from life-sized brass leopards to Aboriginal dot paintings, from an Egyptian mummy casing to a necklace of human teeth, and from Amazonian arrows to Kachina dolls. Gilliland’s favorite object in the collection is the set of Brazilian poison darts she researched. It piques her curiosity because of the functionality of every piece, even the seemingly decorative monkey mandible. The exhibit runs through Aug. 29. To learn more, visit the MOA’s website.